2)The country circled in yellow are Germany and Austria and they are in an alliance. The people in blue are Serbia, Russia, France and Britain and they are in their own separate alliance, where they help each other for wars and fighting but not to help each other develop. Serbia is the smallest, because they’re the newest and didn’t have any military background, and until Russia helped, they were being picked on by Austria. 3_When Austria’s leader goes to Bosnia he gets assassinated, and Austria blamed Serbia for this. Serbia denies being guilty and Austria says if they don’t find who killed him they will take military actions, and Germany decides to help Austria. Austria and Germany go at war with Serbia but to get there they attacked a neutral territory Belgium which caused tons of other small wars. 4)Germany, France and Britain all start fighting because of the war over Serbia, because France and Germany always had rivalry. 5)Britain fought Germany, because they had an alliance with Russia and that caused more problems that they already had. 6)Serbia gets accused for the assassination of Austria’s leader, and they deny it which sparks problems. Austria declares if they don’t find the person then they will give military action. Germany agrees and helps Austria, Russia, France and Britain all help Serbia and this caused Germany and Austria to have war against France and Britain. Since Canada was a part of the British Empire, they are now in the war. 7)The perspective is from the triple entante and the people who are helping Serbia. Germany was geared up in the picture, because they were ready to fight Serbia and anyone in the triple entante. In Austrias cartoon they say “if you move I’ll” which shows that Austria is literally picking on Serbia, because they’re smaller than them and they can just push them around. 2) the dependancy ratio is roughly 44% and this is low. 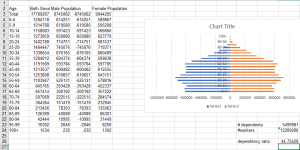 3) Based on the pyramid, the country is on a good stable run. This shows us that the death rate is slowing down, and the ratio for the dependant ratio is low, meaning that the country isn’t in any debt problems. For healthcare, the children are being born steadily and the elderly are dying, the highest population is around 20-30 years old and this is good for the dependancy ratio. 4) At the moment Chile is doing good, but they should consider slowing down on their birth rates, because their country isn’t as technologically advanced as us, and once they do get advanced the number of jobs are going to decrease, meaning the amount of middle aged workers won’t have jobs. Once there aren’t as many jobs, then the dependancy ratio goes up, this means that the country will start facing problems. The advantages of having pressure groups, are that different groups of people who have the same thoughts of changes can hire people to fight for the change that they want. The disadvantages of pressure groups are that it may not benefit the public, and not everyone will agree on the cause. One of the examples was the awareness day for golf, and that only benefited the golfers in B.C, although they had stats for money and how much B.C could make, it doesn’t help everyone and not everyone wants that change. Petitions in my opinion is the best way to get change, because it is a public vote, and you need a certain number of votes to get the government to actually look at the change. I think that is fair, because everyone gets to vote their opinion and you don’t have to share what you agree or disagree with. I don’t really think there are downsides to petitions, because it’s fair, equal and the government will consider the change if it is reasonable. In class, we talked about HST, and how it got changed back to GST and PST. I think that if there was a lobbyist fighting for why HST should be gone it still would be here today. Civil disobedience is a different way to approach things, it’s where you protest for what you want to change, it can be an individual protest or a group/mob of people standing outside fighting for the change. In class we did Viola Desmond, she was an African lady who wanted to watch a movie on the bottom row, but the people there said her type of people are on the balcony which was supposedly was a “tradition”. An advantage of this is that the government or whoever can see how many local people actually want the change, because they’re actually using their time to protest. A disadvantage is that there could be consequences, with the law or you could get in trouble for protesting. You also would be wasting time standing outside if no one acknowledges the change you’re driving for. This week in Math 11, we learned how to use the Cosine Law. To use this method, you need atleast 2 side lengths, an angle or 3 side lengths. 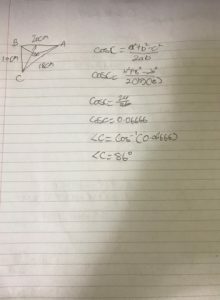 The cosine law is used to find an angle, for the first step you have the givens, a, b, and c is what i use. The equation we use for the first method is, c2 = a2 + b2 – 2ab cos C. One thing to keep in mind is that you can have information from the opposite side. 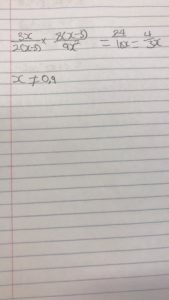 For the example below, we used A= 10 cm, B= 18 cm, C= 20cm. 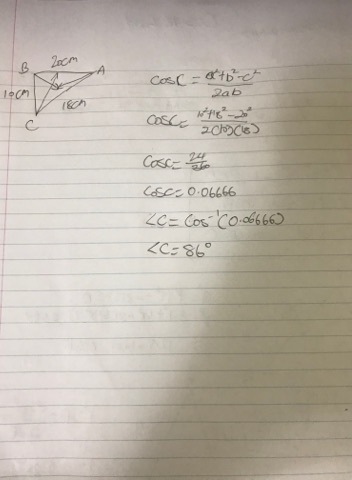 Since we’re given three side angles, i used the second method which requires 3 side angles. For my black poem, I did “I Know Why the Caged Bird Sings,” by Maya Angelou. 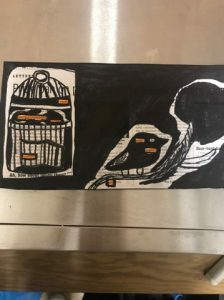 The poem’s denotative meaning, is that there is a bird that’s trapped inside of a cage, and sees other birds and wishes it had their freedom. The connotative meaning of this poem, is that black Americans had no freedom, and that they were being discriminated. The speaker basically describes how life was for the African Americans during this time, they felt like they were trapped inside of a jail, because they had so many restrictions. The caged bird, describes the free bird as a dream, every time the caged bird sees the free bird soar through the sky, it wishes that it could be just like it one day. During this time, the African Americans were always treated horribly compared to Caucasian people, making the African Americans feel degraded, and all they can do is try and use their voice to make a difference; because the bird and the African Americans had nothing but their voices to use. The theme of this poem is that, even if you’re trapped your voice and opinion cannot be oppressed. This poem is significant, because it has an allegorical reference, to the time where African Americans had no freedom and rights. This poem portrays the voice of African Americans, and that their voice matters, nothing can stop them from using it even if they’re trapped in a cage. In the third stanza, lines 16 and 18, there’s end rhyme with the words, trill and still. There’s personification, because she describes the tree sighing, and we know that trees can’t sigh. 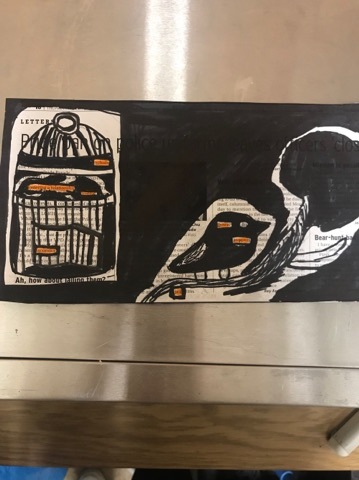 There’s symbols, when describing the free bird and the caged bird, “A free bird leaps on the back of the wind, and dares to claim the sky.” The caged bird, “But the bird that stalks down his narrow cage can seldom see through his bars of rage. The speaker is trying to tell us that these are human’s and not birds, because this is not how birds think. This week in math, we learned how to multiply and divide binomials. The first step is always to factor if possible, we always need to take a look at what we’re doing; either multiplication or dividing. From previous math, we know that if it’s dividing then we need to reciprocate the fraction. 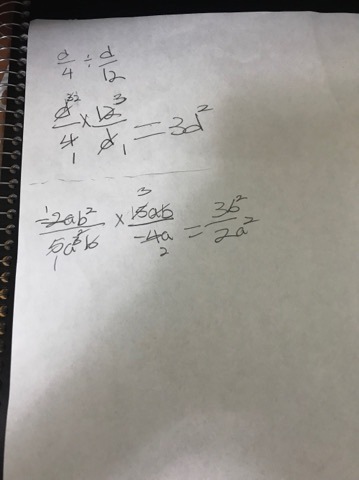 The next step is to simplify all like terms, you always need to find what X can’t equal to, because the denominator cannot equal 0. 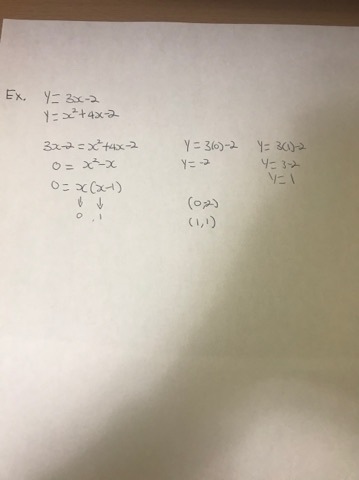 I first found what the X value cannot equal to, so it was 0,9. Next i found all like terms and cancelled each other out X, (X-3). 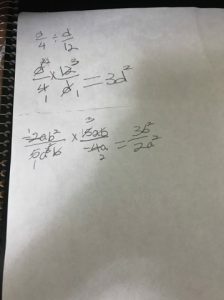 This left me with 24/18x which i could then simplify to 4/3x. 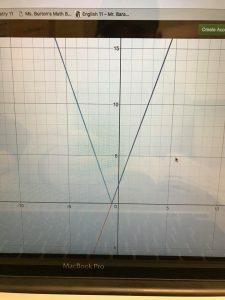 This week is math, we learned how to graph absolute values, meaning the graph cannot cross the X axis to become negative. How this works, is the point it normally crosses to the negative side, reflects going the opposite direction using the same pattern, let’s say we were using 3x+2, when it reaches the point where it’s supposed to cross it goes up 3 then to the other way 2. If we were going up 3 over 2 to the right the reflected side would be up 3 over 2 to the left. We also learned how to do this with parabolas but instead of one line, it will be the vertex that will be reflected, the same rules also apply, the X intercept is like an invisible wall which will not let the line/ parabola cross to become a negative. 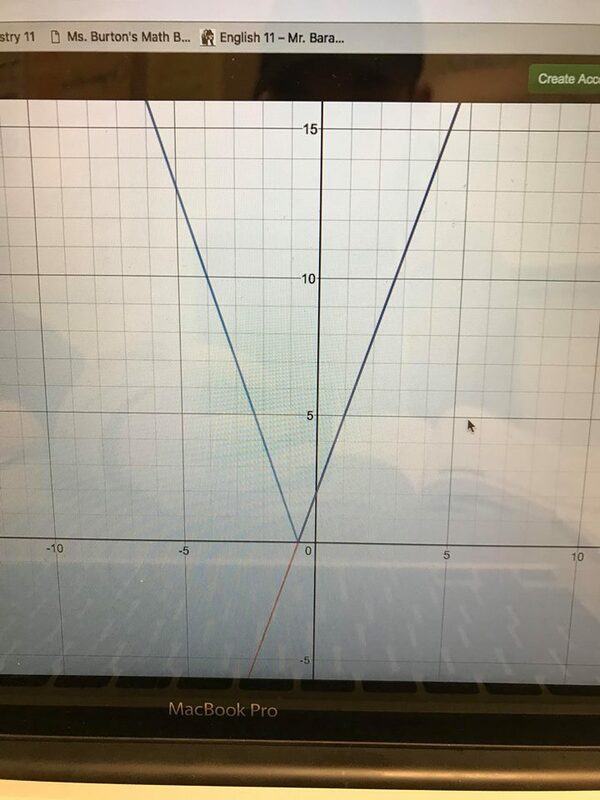 In the first picture, this graph represents the graph of x2+3x-5 and |x2+3x-5|. 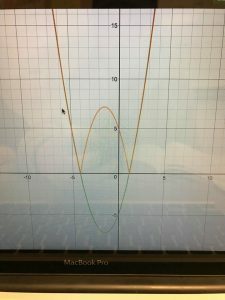 The green line represents the parabola if it were to be just graphed, no absolute values; we can see that it crosses the X intercept making it negative. In the orange lines, we can see the vertex is reflected, because the invisible wall reflected it back to a positive, having the same vertex but positive. Now you want to find the 0’s, because this will allow you to find the y axis. 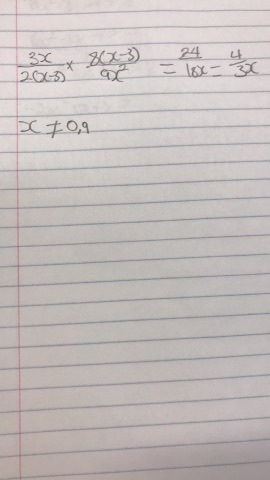 Finding the 0’s will help you complete the equation. Once you find the 2 zero’s, you replace it in any of the equations finding the y axis but it has to be the same equation.